Notice the top cluster is in imperial measurements and the gauge faces are all in one piece. Needs overlays. But it’s an electronic speedo so getting the speedo cable to the cluster isn’t an issue ( just need a hall sender gizmo ). 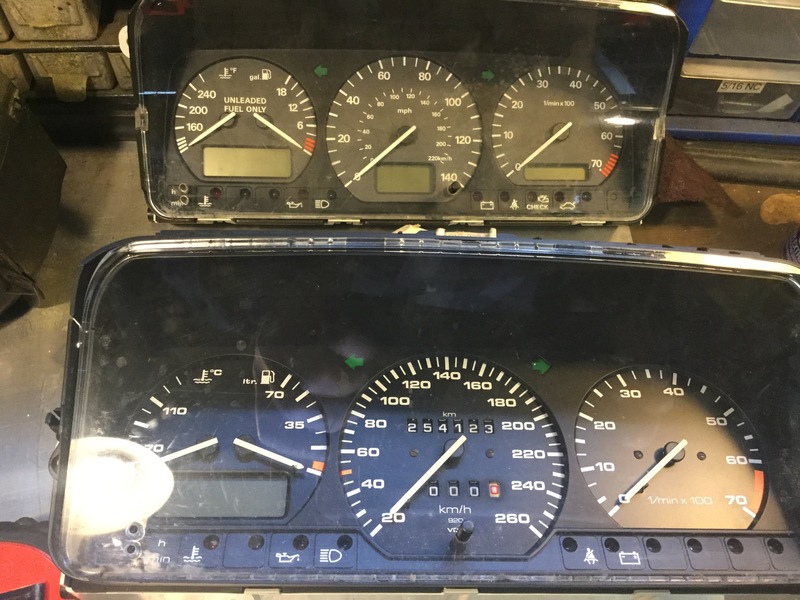 The bottom cluster is from a Passat syncro g60. Mechanical speedo which makes things interesting. Note the revs per kilometre number, 80 less than my stock syncro. Oh I don’t know what I’ll do, I bought them in a moment of weakness ( them and a spare alternator). This entry was posted on March 4, 2017, 7:29 pm and is filed under vanagon. You can follow any responses to this entry through RSS 2.0. You can skip to the end and leave a response. Pinging is currently not allowed.